GNLU is delighted to intimate you and extend invitation to Certificate Course on Contract and Procurement Management. The course shall be organized in the month of October 2014 from 10th October, 2014 to 11th October, 2014. To appreciate the different procurement strategies and methods, and approaches used in a variety of business and project contexts. To build in a comprehensive understanding of the entire bid process management process including evaluation, pre-bid meetings, contract closure and post closure management. Employees working in Public Sector Undertakings (PSUs), Urban Local Bodies (ULBs), and private companies where contract negotiation, procurement and bid process management is encountered with. Students of B-schools, Law schools and Engineering schools who seek to built their career in commercial department and legal departments of corporate houses or in the area of Business Development in B2B Market. Intake & Deadline for application: Intake is 30 participants on First come first serve basis. The duly filled form shall reach GNLU on the said address on or before 6th October, 2014 till 05:00pm. 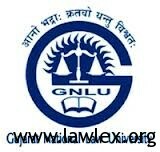 Mode of Payment of Fees: Interested individuals shall download the application form from the university website’s Latest News section and submit the duly filled form along with the Demand Draft in favor of Gujarat National Law University payable at Ahmedabad for the amount stated in the above table.